The book does in every way deserve its popularity as a classic. 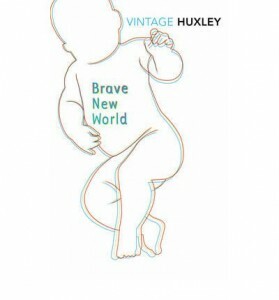 Although I had a few teething problems starting the novel, when introduced to the characters of Lenina and Fanny, I quickly became brainwashed and absorbed into Huxley’s Brave New World. In this World, the totalitarian regime achieves subtle but absolute control through test tube babies and hypnotism, conditioning humans into a caste system that they do not question. It consists of intelligent and strong humans (Alphas and Betas) taking the highest positions in society, and subservient ‘semi-moron’ humans (Deltas and Epsilons) that are genetically modified to enjoy completing menial jobs to serve society and know nothing else. ‘Everyone belongs to everyone else’ in this society, that forces promiscuity upon its people through brainwashing, even when they are foetuses. Despite this book being written over 80 years ago, the ideas of eugenics and the caste system are as horrifyingly relevant today as they were then. This is one of those books that gets you thinking about society as a whole and the lives we as individuals live. Do we have overreaching scientific advancements that threaten the boundaries of morality and nature? Can science go much further without being immoral? Does technology rule our lives, with computers and media becoming a necessity in our everyday lives? Is our society work-based, solidified in a caste system, with people acting as machines completing jobs with very little chance of social mobility? Despite being equal on the surface, are inequality and unfairness entrenched in human society? These are but a few of the questions that your mind could be forced by Huxley into attempting to answer. The potential dangers of technology, science, and politics – supposed pinnacles of human advancement – are explored by Brave New World. The book presents to us a whole world controlled by a strange, sinister and cruel combination of these factors. Although the answer to most of the questions above would, at the moment, probably be ‘no’, many say that the book is a worryingly realistic depiction of our future. It is a book that I won’t forget in a hurry, and a thoroughly recommendable read that is incredibly thought-provoking and well written.